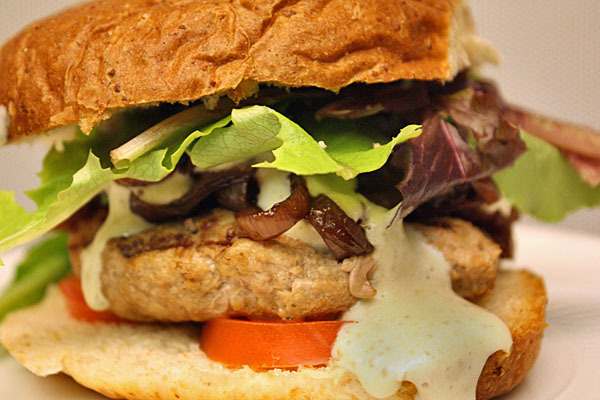 It’s a high-flavor take on the oft-overlooked turkey burg, which combines sweet and sour onions with a lemon-y basil yogurt. Dare I say it was as good, if not better than the previous night’s beef burger with bacon and egg? 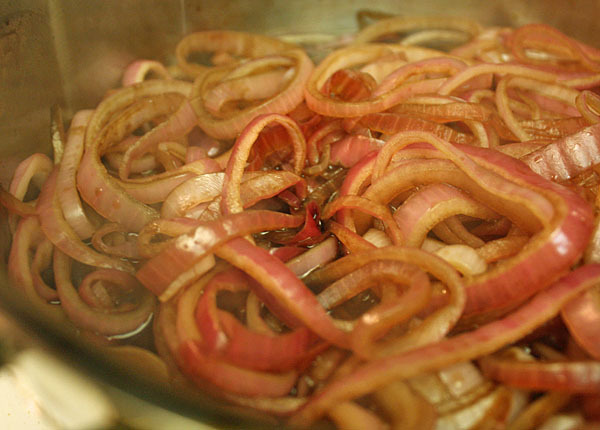 First thing you’ll want to do for this recipe is tackle the onions, since those will take the longest to cook. That means slicing 1 red onion and combining it in a pan with 3 T of balsamic vinegar and 3/4 cup of water. 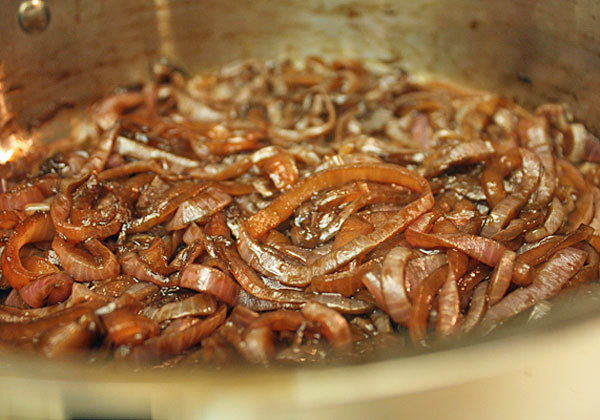 Bring to a boil and then reduce to a simmer until the onions are tender and the liquid is almost gone (about 30 minutes on low to low-medium). You’ll pretty much slap together the rest of this meal while the onions cook down. In a bowl, combine 10-12 oz. 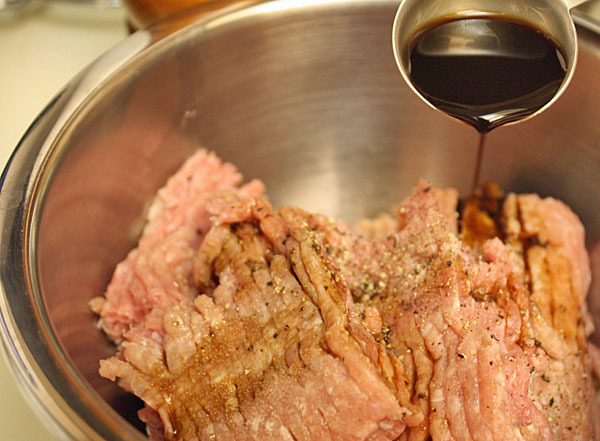 of ground turkey with 1 T of Worcestershire sauce and salt and pepper. 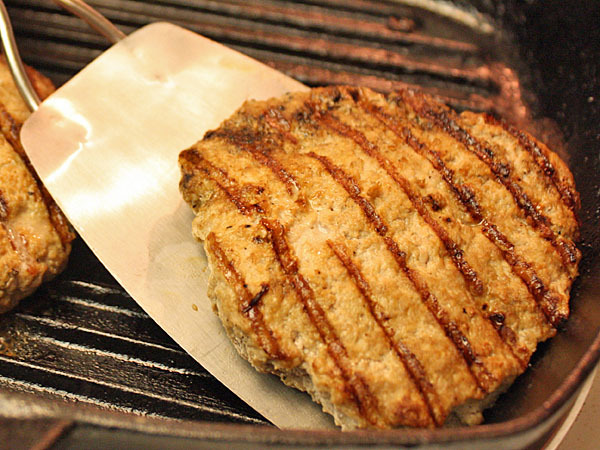 Once you mix the meat, split into however many portions you are making and form patties with your hands. 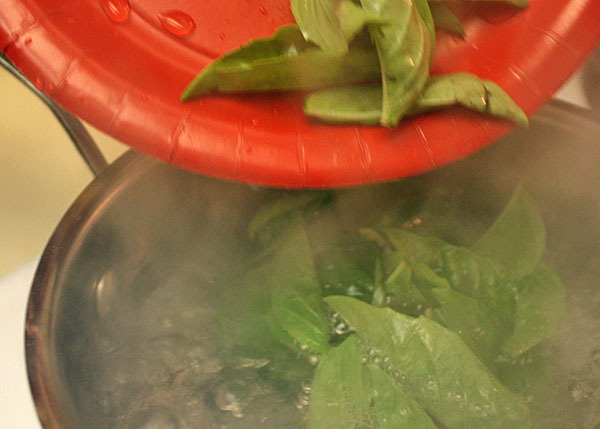 … toss ’em in a pot of boiling water for 10-20 seconds to soften the leaves. Pat them dry and reserve. 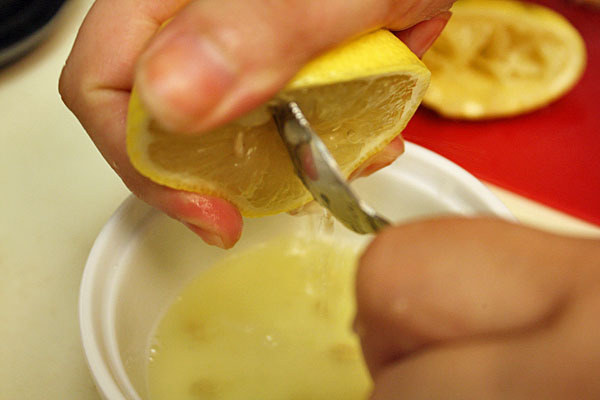 Next, juice 1 lemon. This would also be a good time to gas up the grill or turn on your broiler. Since it’s been raining so bad in Orange County, I used a cast iron grill pan and my oven’s broiler to cook the burgs. 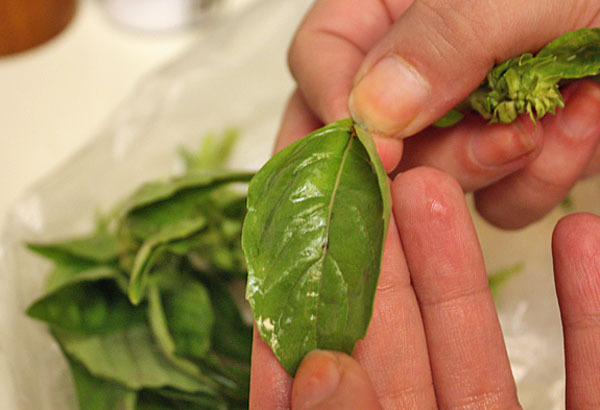 In a blender, combine basil leaves with lemon juice and 5 oz. of non-fat Greek yogurt. 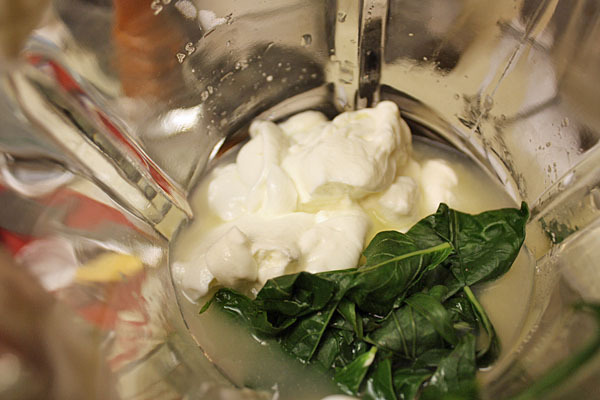 Blend until the yogurt turns bright green. 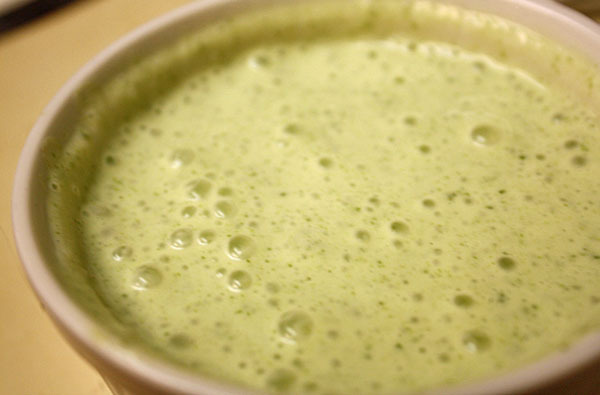 Toss in the fridge so that it gets cold and thickens up a little bit because the blending process will thin it some. 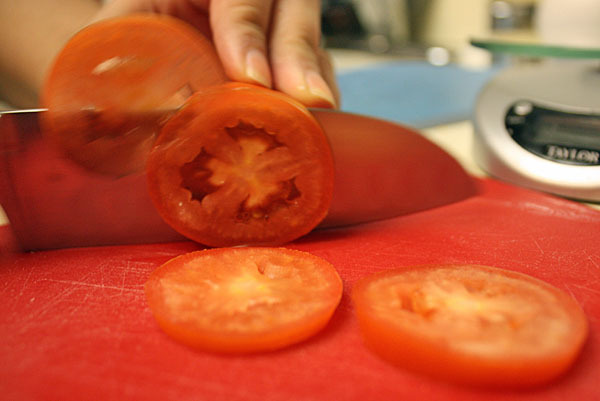 Slice 1 vine-ripe tomato, and while you’re at it, drop the split on 2 whole wheat buns. This should be about the time the onion compote gets done, which is convenient, cause this burger is ready to make its debut. 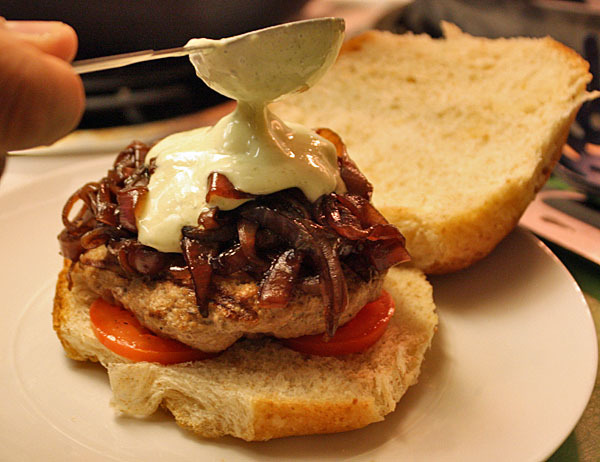 To assemble: Bottom bun, tomato, turkey patty, a share of the onions, 2 T of yogurt and top with a handful of mixed greens. That’s it. Enjoy. Seriously. My first bite caught me hella off-guard. Possibly because yogurt and balsamic are two ingredients I am fairly unfamilar with, but mostly because I associate blandness with turkey burgers and this was anything but. This one scares me, but since we seem to always have the same likes and dislikes, I just may try it. @Rick: It was scary to me too. Balsamic? Yogurt? Turkey burg? But, dude! Sooo good. Lots of citrus-y sourness, with only mild balance from the turkey and onions, but it’s killer.